The Northern Undead Asylum Revisited is a special instance of the initial area of Dark Souls and Dark Souls Remastered. Players can access it by going to the Firelink Shrine and climbing up to the crow's nest on the upper portion of the broken firelink structures. Once on the nest, use the action button to "curl into a ball" and wait until the crow brings you back. Be mindful that the revisted instance features stronger enemies. Upon returning to the area the first thing you will notice is that the Hollows are wielding torches. Since the player typically has horrendous fire resistance, these foes deal heavy damage to you if they can connect. Be cautious when engaging these enemies, as they can easily wreck you if you are not careful. The only new area unlocked in the Northern Undead Asylum is the third level's west wing (where you may have noticed an item which you could not collect after the very first fog gate of the game). 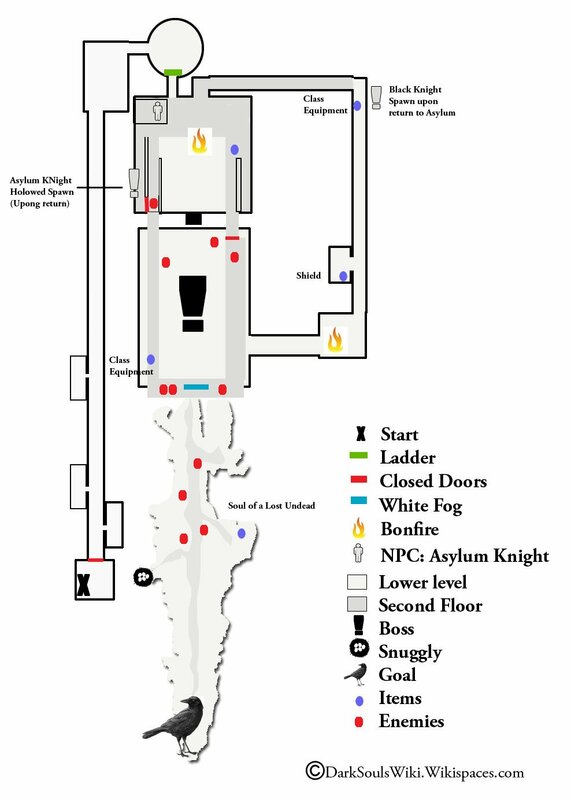 If you recall from your first run-through of the area, the door behind the lone Undead Soldier (Sword) on the third level's west wing was locked, but is unlocked with the Undead Asylum F2 West Key which you should have just gotten from the Firelink Shrine on your way back to the Northern Undead Asylum. Trivia, player notes, fan art and such go here. From Unlock the elevator shortcut from Undead Parish to Firelink Shrine. Activate the elevator, then face the Firelink Shrine. As the elevator wall facing the Firelink Shrine is broken, you can see a broken roof near the bottom of the elevator. Jump off the elevator and land on the broken roof. Turn right onto the mossy rocks and position yourself directly in front of the beam supporting the neighboring tower. Roll onto the beam and make your way up the steps (they fold back on themselves about halfway up). When at the nest of the giant crow, curl up into a ball and wait. The first time you curl up you may have to wait a little while to be picked up.